I just drank a bottle of Minute Maid Pulpy. They say it’s got ‘no preservatives added’. Aw, c’mon…It’s bottled juice. Is that even possible? So I thought maybe... going all natural is the best way to go. Mother nature always had the best way to deliver fresh and exciting stuff without all the nasty chemicals added to the mix. I didn’t believe it the first time I heard it’s got no preservatives added. So I read the ingredients (even the fine print) and everything checked out! It really has NO PRESERVATIVES ADDED! That means it doesn’t have ingredients that may turn out to be allergens, or worse...carcinogens! Whew! Now that’s healthy goodness that tastes so good, I... can even let my year old nephew drink it without worrying about nasty stuff ruining his growing body. So okay, it’s got no preservatives added. That’s really good, right? Not just because it doesn’t have those icky, harmful ingredients, but it also means... it's packed with all the vitamins and nutrients Mother Nature stuffs in all the oranges she makes everyday. So far anyone who still has a hard time believing that Minute Maid has got no preservatives added - meaning it's THAT natural, it's almost like it's plucked straight from the tree, it's just as Mother Nature wanted your orange juice to be, it's got nothing but the good stuff yes, none of those potentially toxic stuff that can harm your brain, kidneys, heart; cause tumors aargh- the list of preservatives' bad effects just go on!!! Anyway, just to prove a point on just how good Minute Maid Pulpy is 'cause it's got NO PRESERVATIVES ADDED, I'm gonna replace water and drink only the freshest most pulpiest orange juice every bottle of Minute Maid Pulpy brings, for a whole month. Yup, for 1 whole month! I totally agree! Minute maid keeps me hydrated when I practice yoga. No sudden sugar rush. Just a natural energy that flows and feels real good! I love it! Hi, I am on agreement with you. I just think about how many people actually bother to check the labels on the food they eat to see just what it is that they are taking into their bodies? It is almost a certainty that only few really check labels before taking in drinks and foods. 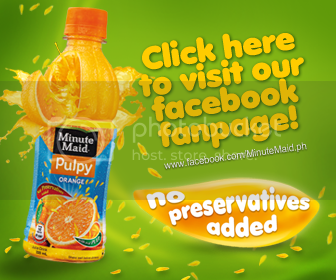 But luckily, with Minute Maid Pulpy, you don't need to check the label because it's guaranted natural and no preservatives added! I really swear it! Let's cheers for that.